Jade Moon dreams of leaving home, of escaping the tiny Chinese village where she lives alone with her father, her grandfather, and their faithful servant, surrounded by gossiping "Aunties" who are all too familiar with her many faults: clumsiness, stubbornness, and - perhaps worst of all - a longing for independence. All she can see is a future married off to a local brickmaker, but that changes with the arrival of a stranger. Sterling Promise arrives from Hong Kong with news that an uncle Jade Moon never knew she had passed away recently, leaving behind papers that could allow Sterling Promise and Jade Moon's father into the wide open promised land of America. If she could just get to that new country, Jade Moon thinks, what possibilities could await her? The United States of 1923, though, is wary of admitting more Chinese immigrants, and Jade Moon's long sea journey is followed by detainment on Angel Island. Getting to San Francisco will take cunning and bravery, and surviving there will be even harder. 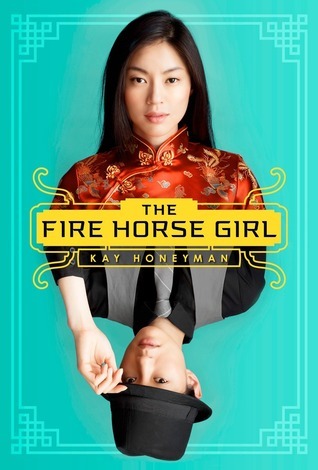 Fire Horse Girl is a complicated piece of historical fiction. Honeyman explores the life of a girl in early 20th-century China, the San Francisco of the 1920s, and the Chinese immigrant experience on Angel Island, a bit of American history little known outside the West coast. The stories aren't so much woven together as tacked onto one another, which may be why the pace drags in places. Jade Moon is a likeable character because of - rather than despite - her prickliness, as the independent nature that seems to offend her contemporaries has strong appeal for twenty-first century readers. Story-telling is a theme that recurs throughout her narration, and she is determined to tell her own story. A lengthy author's note tells how Honeyman came to the tale and provides further information on the historical events, people, and places that inspired her, as well as a paragraph on Chinese astrology. "The next Fire Horse girls," she notes, "will be born in 2026." Sign into Goodreads to see if any of your friends have read The Fire Horse Girl.